In this article, we will review the potential options and practical solutions for on-site evaluation of concrete strength. Concrete (compressive) strength is by far the most important property of concrete. It represents the mechanical properties of concrete; for example, the 28 days compressive strength of concrete cylinders is the key parameter in most design codes (ACI 318-14, CSA A23.3-14). Strength is also considered (at least in the old school) a key factor for durability performance. Coring and testing for strength might the first and most reliable solution. In this case, concrete core is taken from the existing structure. The core needs cutting (sawing) and surface preparation. The core is tested for compressive strength. 1) This is the most reliable method to estimate the compressive strength. The method is relatively fast. 1) It is destructive. Not only it damages concrete integrity, it might affect reinforcing bars in RC structures. Rebar locating tools are needed to avoid this problem. 2) Selecting test locations can be difficult. Selecting the best location of cores is relatively subjective. 3) The locations of cores needs to be repaired. 4) Coring is not an option for owners of important structures, especially when there are concerns about further damaging the structure. The concept behind this method is that the tensile force required to pull a metal disk, together with a layer of concrete, from the surface to which it is attached, is related to the compressive strength of the concrete.The pull out test is normally used for early diagnosis of strength problems. However, it can be used to evaluate the strength of concrete in existing structures. 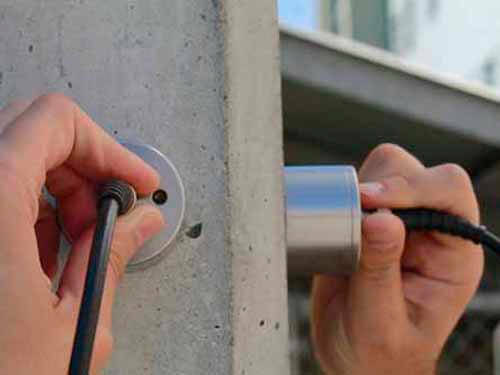 Pull out testing involves attaching a small piece of equipment to the exterior bolt, nut, screw or fixing. This is then pulled to the designated stress load level to determine how strong and secure the fixing is. 1) Relatively easy to use. 2) If relationship to strength is established, the mothod can deliver robust test results. 1) It is easy to use for most field applications. 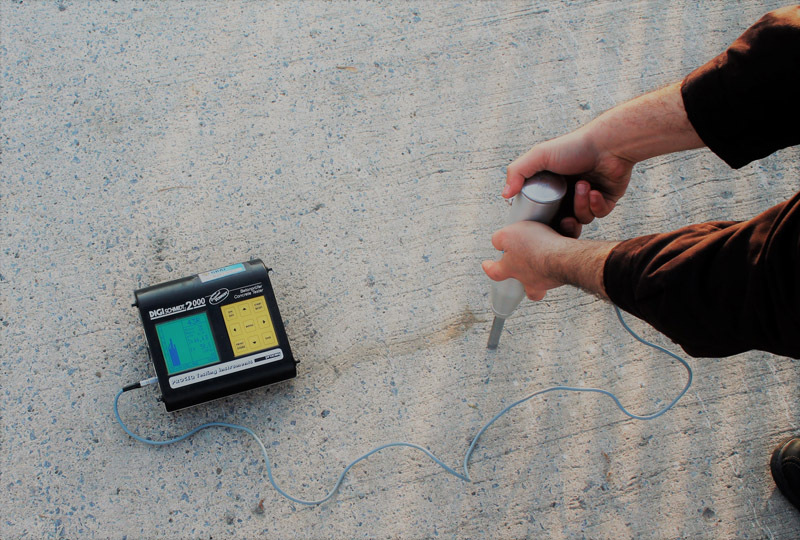 Ultrasonic Pulse Velocity (UPV) is an effective method for quality control of concrete materials, and detecting damages in structural components. The UPV methods have been traditionally used for the quality control of materials, mostly homogeneous materials such as metals and welded connections. With the recent advancement in transducer technology, the test has been widely accepted in testing concrete materials. The test procedure has been standardized as “Standard Test Method for Pulse Velocity through Concrete” (ASTM C 597, 2016). The concept behind the technology is measuring the travel time of acoustic waves in a medium, and correlating them to the elastic properties and density of the material. Travel time of ultrasonic waves reflects internal condition of test area. Some researchers have tried to develop a relationship between the strength and wave speed. 1) The method is affected by presence of rebar, voids, and cracks. 2) There is no enough results for assessing the reliability of the method in the field. This entry was posted in Inspection and Evaluation, NDT and tagged Compressive Strength, Concrete, Strength. Bookmark the permalink. -The test pieces will be cubic 10x10x10cm, very manageable, light weight, take up little space, do not have to modify and little final residue. -The machine for the breaks, may be less capacity, but cheaper. -Use heat curing with wet temperature and you can create a curve of resistances in the time obtaining a very sure estimate of the resistances at each age. The UPV is not suitable on its own. It is more closely related to the stiffness and density of the concrete than it is to strength (Chirgwin, Thesis for Masters of Engineering Science, University of Sydney, 1988). It is also affected by the saturation of the concrete. Also, the correlation to strength has such wide error bands that it is difficult to tell a 50 MPa concrete from a 30 MPa concrete. The other, unmentioned issue with coring is the restriction on coring sites. Congested areas may be the most problematic for the concrete quality, but the most problematic for strength. You have omitted a critical method for estimating the concrete strength gain in-situ during construction: The Maturity Method. Preferably, a series of strength curves are set up ahead of time to check the strength gain under standard, accelerated and retarded conditions over 28 or 91 days. The maturity of the concrete is then assessed using a maturity meter (See J. J. Carino “CN Tower” circa 1976). Samples should be taken, cured and tested at suitable intervals (1, 3 and 7 days) to check that the concrete is the approved mix. When we as a Ready Mix Producer had suspect strengths, we used the tested the concrete with a windsor probe. If the windsor probe told us the concrete met design strength it met design strength. The fact is that all 5 methods are not any good to evaluate the Concrete Strength. Now one is good enough ! In year 2017 soon coming is it a shame that we do not have better methods in construction. Let´s hope everyone working in the concrete business will start to “think outside the box” and that we try to improve many type of tests that we today use. The Average Strength, now known in the middle of a structure, is only one parameter. Surface or the upper one inch concrete quality is also important, some times more important. How do we measure that in a simple way in a bridge deck or in an other wearing surface? Any idea? Many engineers in Europe and USA are useing the pull-out method to assess strength of existing structures (slabs, piers, beams, columns) succesfully. It is recomended to use the method by making correlations to cores of the same structure (as this publication specifies). However, there is documentation on how the method is very reliable even when using the manufacturer given correlation, wich was done by testing data of all sorts of concrtes and different laboratories. In my mind, pull-out is very well correlated to cylinder/cores because the failure mecanism is very similar. Designing concrete structures requires substituting f’c in empirical formulae. There is only one way to get this value – compressive test on samples. All other methods may only be correlated with compressive test but their results cannot be substituted in the formulae. It is a matter of engineering judgement if f’c from NDT correlations may be used to verify design assumptions. The best design may fail. In that case, if the Engineer of Record (EOR) has used method prescribed by Codes to assess f’c, then the EOR will not pay. The engineering judgement will be questioned by the court, and EOR may pay. Hence, any NDT, both existing and developed in the future, have very limited value in formal cases. We can use them in many cases to get general feeling of the situation, but not more than that. Publication in a good journal may be considered by a court, but a good attorney may always question its validity. And EOR may pay. To risk paying a judgement or not to risk is personal choice of the EOR. So in the world of real construction NDT is useful in very limited cases and never for formal assessment f’c. In academic world, NDT is very useful for getting points for publications. But this is a very diffirent story. It seems really important to me that you would want a site evaluation, especially when it comes to the strength of your concrete. A couple of years ago, I was walking on the sidewalk of privately owned property and it ended up caving in once I stepped on it! That is definitely a no-go and I can imagine how you would want to prevent that with a good evaluation first! Should be there a correlation and calibration of the rebound hammer device with each specific type of concrete mix for the evaluation of strength ? Is there any specific method for this type of calibration linking rebound hammer device and a concrete mix design ? I like your suggestion about concrete strength evaluation. It’s a good thing that you mentioned ways on how to do it, especially that the strength is considered as a key factor for durability performance. If I were to work in a building construction project, I’ll hire a reputable concrete delivery service that can make our work easier. There will be no need for us to do the mixing process and other stuff. I will also do your suggested concrete evaluation methods. Thanks!